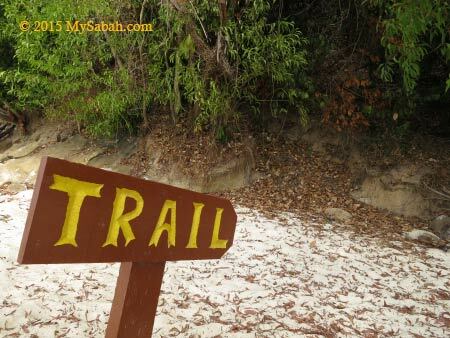 Tourists to Kota Kinabalu City (KK) always ask, out of the five islands of Tunku Abdul Rahman Park (TARP), which one is recommended. 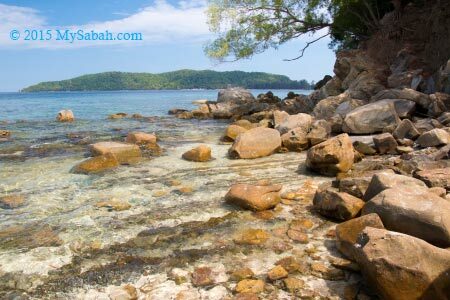 My answer is – if you expect a famous and exciting tourist destination, go for Sapi or Manukan. 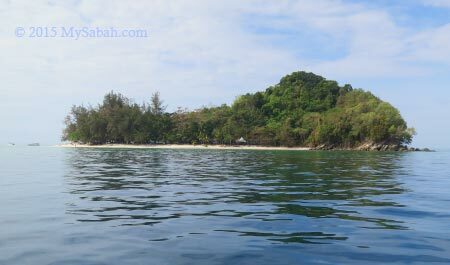 But if you only want a quiet beach to laze around and unwind, Mamutik Island (Pulau Mamutik) is a small island with big space. 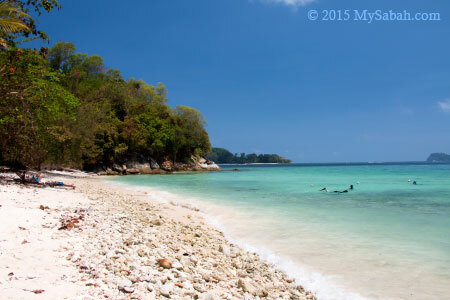 Pic: Mamutik Island, looks like a crocodile head isn’t it? 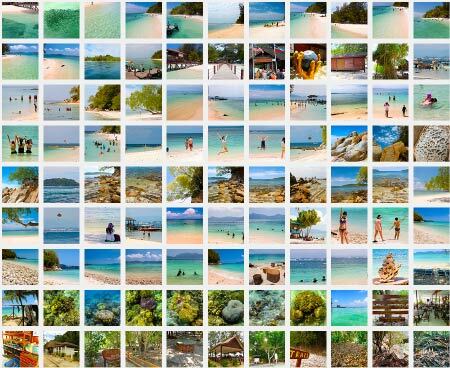 People who want to avoid the crowd will love Mamutik Island, as it is less touristy than Sapi and Manukan, the islands where they would see more people than fishes, and human noise is louder than splashing waves. Being the smallest island of TARP, Mamutik is like an unsophisticated child who doesn’t try to impress you, it may not have charming personality but you feel more open up and relax. Mamutik is rated by some tourists as an average island because of three reasons. First, the sea there is quite rough and water turns murky sometimes. Second, the strong waves wash many coral fragments to the shore. Stepping on this jagged surface can be a discomfort to sensitive feet. Last, the density and variety of corals isn’t great. All of the above are true. 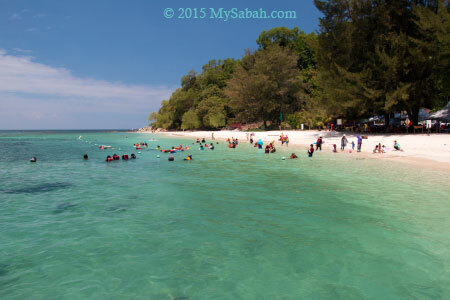 However, Mamutik still has one of the most beautiful beaches near KK and its photo is good enough to be used as postcard. Though lack of WOW factor, Mamutik isn’t lack of happy customers who appreciate the ambience of tranquillity and privacy offered by this less-crowded island. 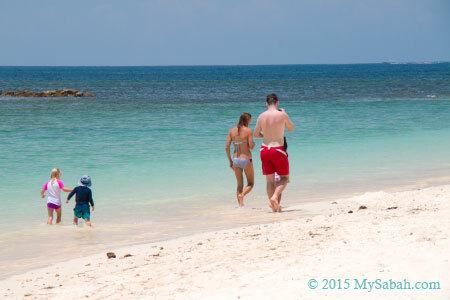 Mamutik Island has long stretch of white sandy beach about 200 Meters in length. The sea can be choppy occassionally and the water is getting deep after 10 Meters from shore, so be careful if you don’t know how to swim. Every visitor can get a big share of space, swim freely and won’t collide with others (but watch out for jellyfish). Without many eyes around, tourists here behave relatively more relax. However, the visitors seem to congregate in one or two places. Probably they feel safer to stay near to one another, or these places are near to toilet. Anyway, there are some sections that has few or no tourist, so feel free to pick a zone as your “private beach”. Move further away from people, you can find many good photography spots with clean background, as if you are on a remote island. 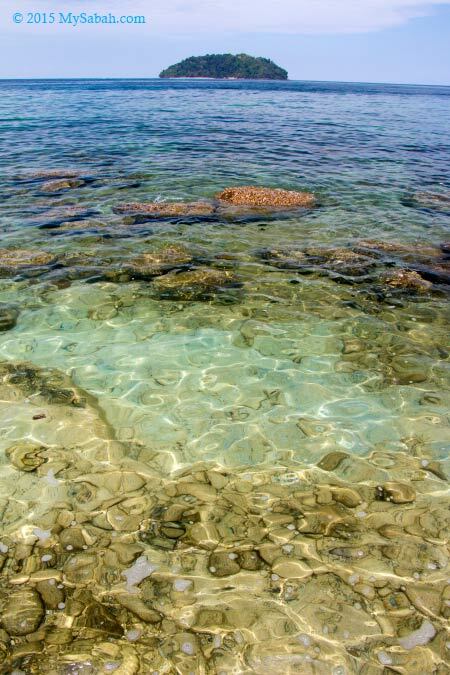 Most coral fragments are concentrated in the water. The beach is still mainly fine sandy beach that is nice to walk on. Pic: You can count the number of tourists here by fingers. If we are willing to pay more for bigger hotel room, the ample personal space in Mamutik is a great value, isn’t it? 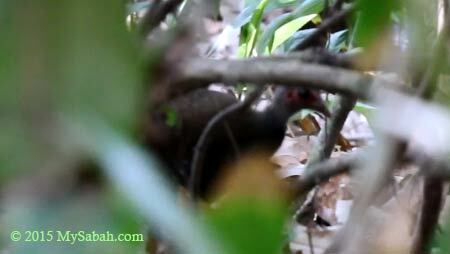 If you go to the east side of Mamutik, there is a more secluded area very well-shaded by tall casuarina trees. 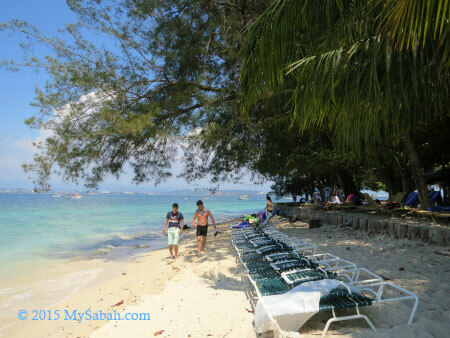 The beach chairs are reserved for the hotel guests from Shangri-La’s Tanjung Aru Resort. The place is quite cooling and suitable for chilling out after a swim under hot sun. You may walk or snorkel at the beach there but please keep your voice down. The staff would ask noisy outsiders to leave. Walking on the coral fragments with barefoot isn’t too bad. Just take it as a reflexology walking therapy lol. My feet have thick skin so it doesn’t hurt at all. You can wear slipper if it’s a problem. 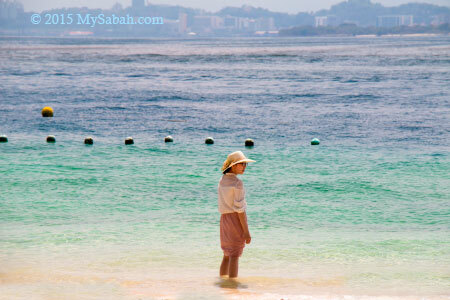 The coral beach is quite well-kept to near pristine state since it’s a semi-private area. Turtles know it. 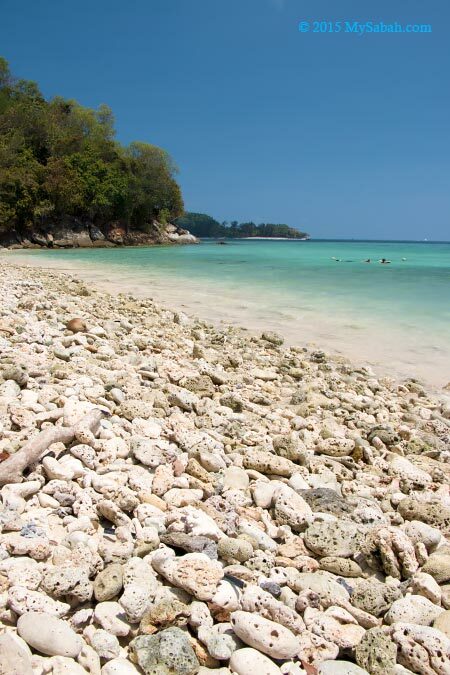 On 26 Dec 2009, a hawksbill turtle landed on this beach to lay its eggs. It’s a good sign that turtles are coming back. We still face a lot of challenges to conserve them due to increasing plastic garbage in our sea. FYI, if you explore further to the edge of the beach at west side, you will come to a rocky beach with nice view. The rocks in the water is slippery so be cautious when you walk on them. Mamutik Island is located in the center of TARP, so you can see four other islands clearly from there. In the past, all five islands were part of the mainland. After Ice-Age ended, they were disconnected from mainland about 1 million years ago. 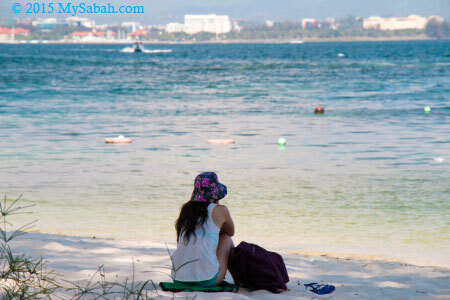 Mamutik Island is the second nearest island to KK, so you can have a good view of our city only 3 KM away. Though travellers were away from the city, some can’t take city totally out of their mind. On Mamutik, I always see people sitting and staring at the sea and city for a long time, or look at the planes flying in and out of KK International Airport. I wonder what’s in their mind. Were they thinking about their relationship, work, future or nothing? Whatever, Mamutik is a good place for daydreaming. Oh by the way, since Mamutik is nearer to city, your phone may have good access to 3G network (Celcom seems to have the best coverage here). Besides sunbathing and swimming at Mamutik, snorkelling is an enjoyable way to see the underwater world. To be honest, I’m a bit disappointed with the experience. 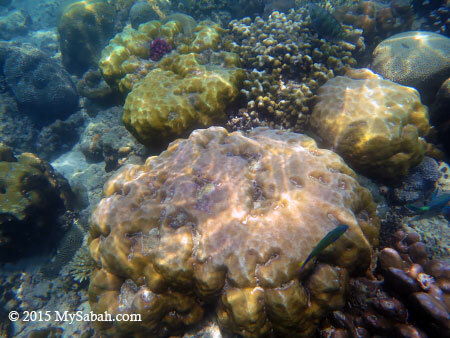 Compared to other islands, the variety of corals here isn’t so good (but not bad). 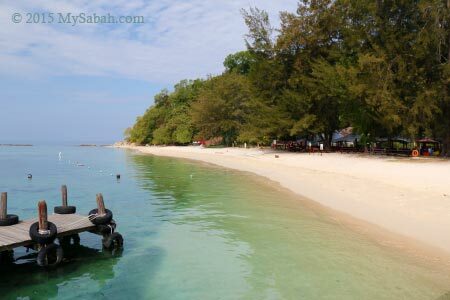 The best location to go snorkelling is the sea in front of the coral beach (another best spot is near rocky beach at the west side). The visibility is ok (about 5 Meters). That area is dominated by brain and boulder corals. They are quite abundant and big in size, often in yellow or brown color. Some have tubeworms (or Xmas Tree Worm) live in them. 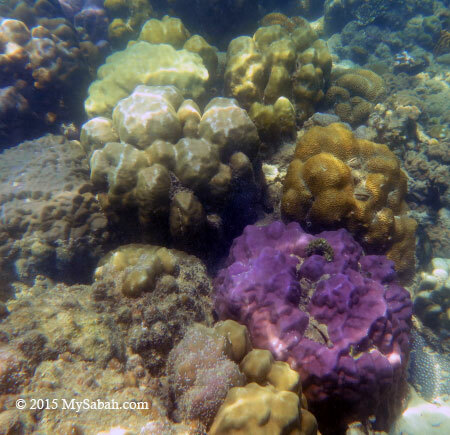 The most beautiful coral is the purple color Porites coral (see photo above). Not many soft corals are found though. It’s cool that I found plenty of fishes even in shallow water. I even saw a lonely barracuda. The variety of fishes is good, but I can’t tell their species other than “Nemo” (clownfish), parrot fish and damselfish. 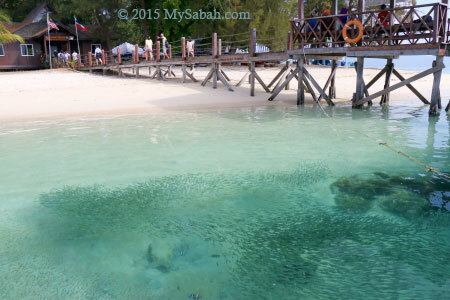 A reef fish expert is able to spot 63 fish species in 45 minutes of snorkelling at Mamutik. 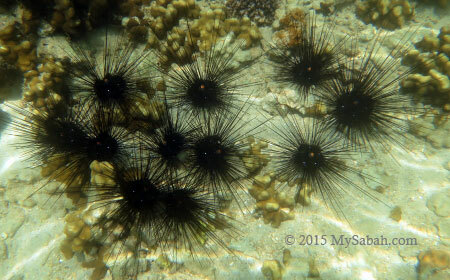 Be careful when you snorkel in the sea near the jetty area, there are many sea urchins among the corals. In case you get stung by sea urchin, just keep calm and look for the lifeguards at the beach. 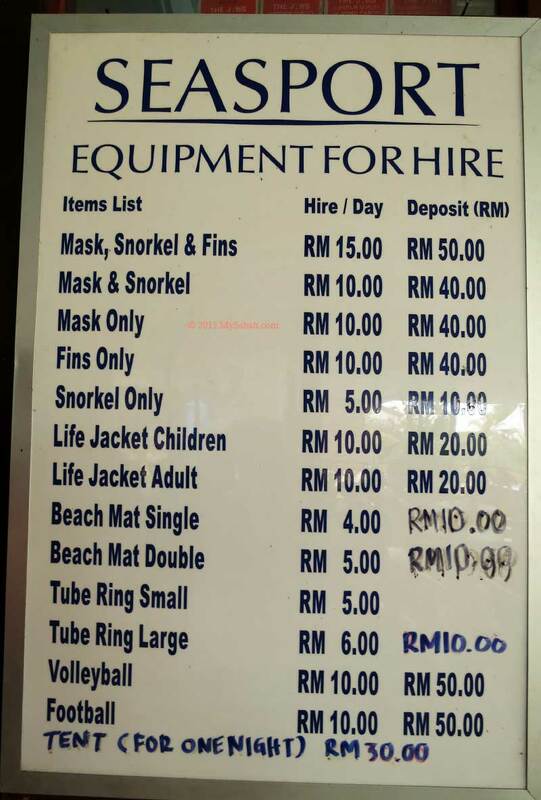 Snorkelling set (snorkel, mask, fin, life jacket) are available for rent on the island, so are beach mat, tube ring, camping tent, volleyball and football. You may check out the price list (as of May 2015). There is a canteen named Koktas Cafe that sells basic meals and drink. You can get food such as chicken rice, sandwich and fried noodle there. 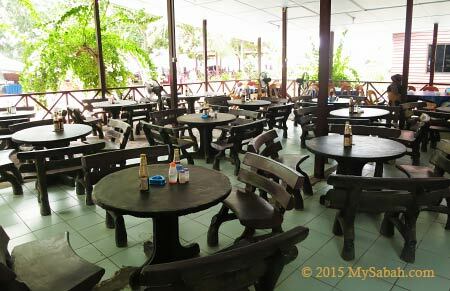 You would spend over RM10 (≈US$3) per meal as everything is priced higher on island. Better bring your own food. 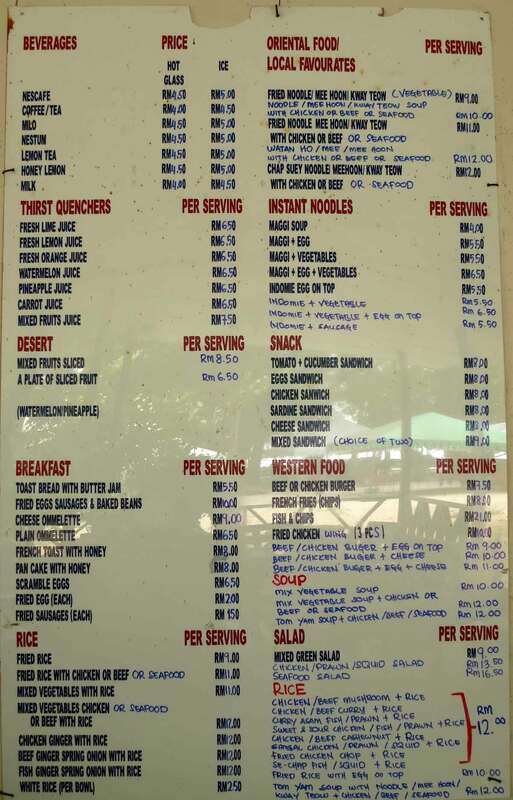 You may look at its menu and price list JFYI (prices as of May 2015). Pic: there are many lunch buffet stalls on the island. May serve good food but won’t be cheap. Next to Koktas Cafe is a grocery and souvenir shop, where you can buy T-shirt, beach wear, slipper, hat, towel, snacks (cookies, potato chips, chocolate bars, nuts, etc. 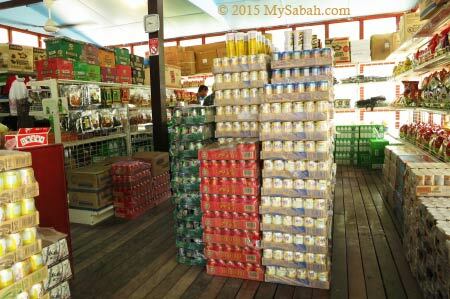 ), instant noodle, insect repellent, bottled drinking water, soft drink, ice cream, etc. Beer and cigarette are available. It’s also where you rent snorkelling gear. 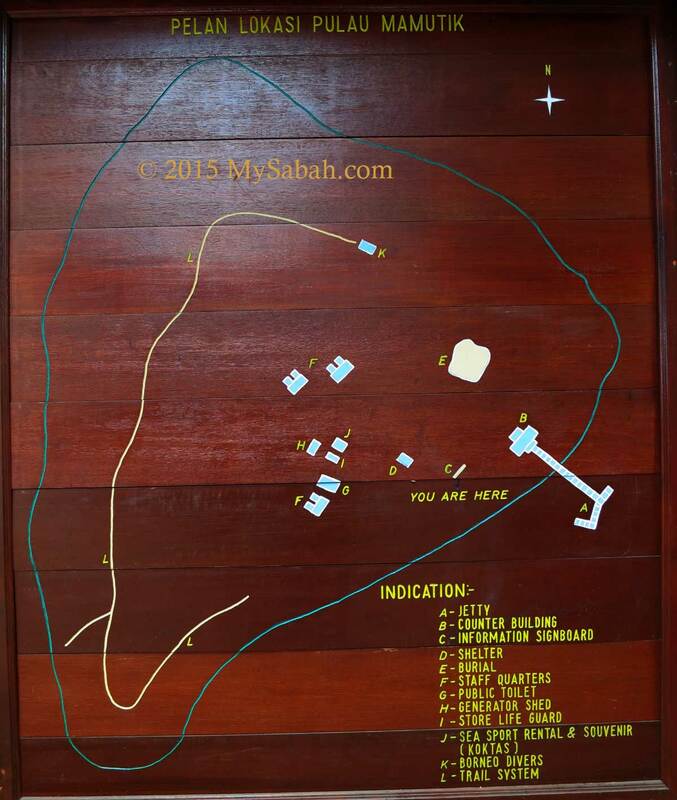 There is no hotel, resthouse and accommodation on Mamutik Island now, but a new hostel would be ready by 2017. Camping is allowed under the permission of the park warden. 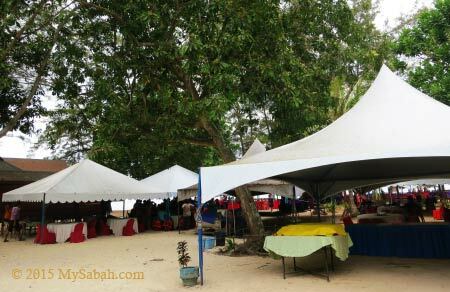 Camping tent is available for rent at RM30 per night (≈US$9). The park requires the camper to pay a small Camping Fee of RM5 (≈US$1.50) for adult and RM2 (≈US$0.60) for child (below 18). 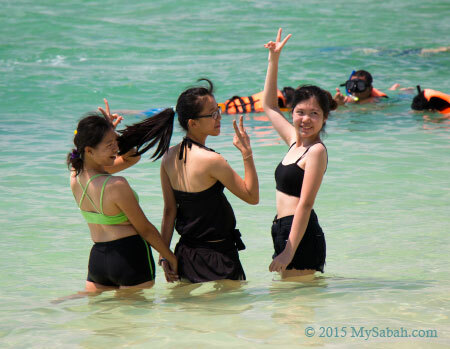 Please noted you need to pay additional RM50 (≈US$15) to boat operator for return trip next day. The bonus of camping here is – campers will have a wonderful night view of KK city light and sunrise view of Mt. Kinabalu (if weather is good). Pic: public toilet with shower heads outside. The toilet on Mamutik is not well-maintained, with some broken door locks and toilet flush, a bit dirty sometimes. 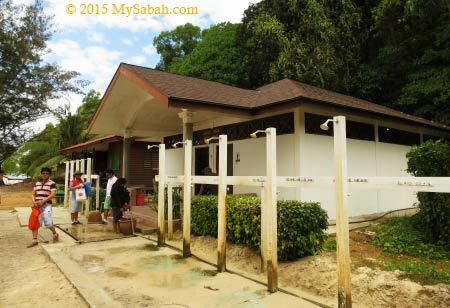 Built by Borneo Divers, a PADI 5-star Dive Centre and Instructor Development Centre (IDC), Borneo Divers Dive Academy has started operating on 18 May 2016. Their main role is to provide beginner and advanced scuba diving courses in this centre completed with swimming pool, dive station (with full range of dive equipment) and classrooms. 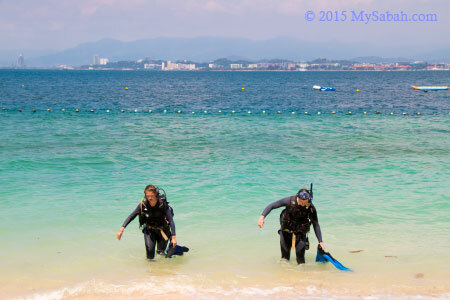 If you want to experience scuba diving without a diver license, you can sign up for their Discovery Scuba Diving, which costs about RM300 (≈US$90) per person and includes two dives (guided by dive instructor). 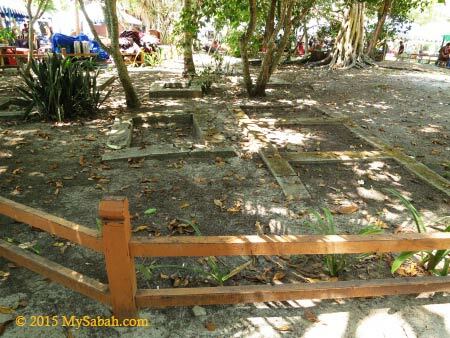 Pic: old cemetery belongs to the past residents of Mamutik, before the island is gazetted as national park in 1979. The burial ground is inside a fenced area. Just to let you know so you won’t unknowingly camp on a grave. At the north of Mamutik is a forested ridge. If you have 20 minutes to spare, you may walk its 385-Meter jungle trail. There are a lot of mosquitoes so insect repellent is a must. However, this regenerated secondary forest is too small to support rich diversity of flora and fauna, so there is nothing much to see. The only highlight is Philippines Megapod, a red face chicken-like bird that lays its eggs in mounds of sand at the edge of beach. I spotted 3 of them in my last visit. They were busy digging the soil about 5 Meters away from me behind the bush. 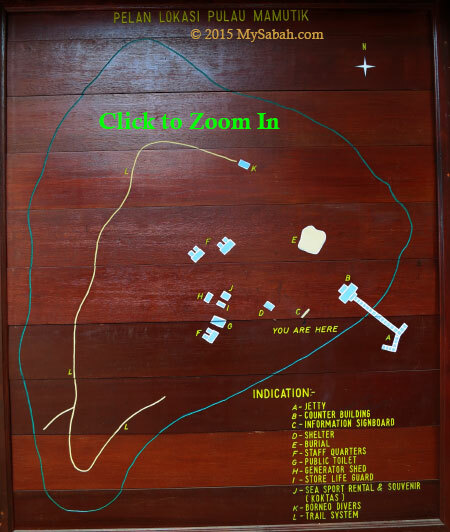 Mamutik Island (see Location Map) is open from 8:00am to 5pm to public every day. 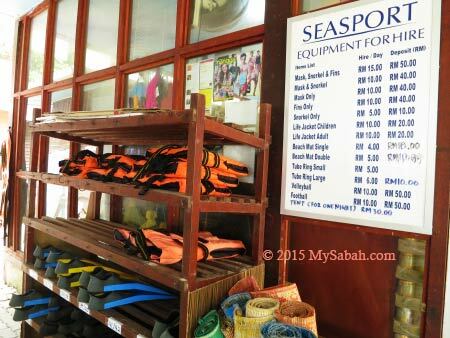 You can hire a boat (for about RM30≈US$9) at one of the boat terminals in KK. The boat transfer is available every hour and the ride to Mamutik takes about 10 minutes. Besides paying for return boat transport (about RM30≈US$9, 6% GST tax and terminal fee included), you need to buy ticket (known as Conservation Fee) from the park to enter the island. The table below is the ticket rates. 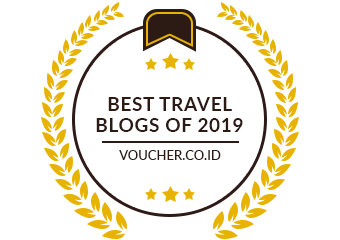 Please note if you are on an island-hopping trip, you only need to buy this ticket once, and you can reuse the same ticket to enter other islands of TARP on the same day. 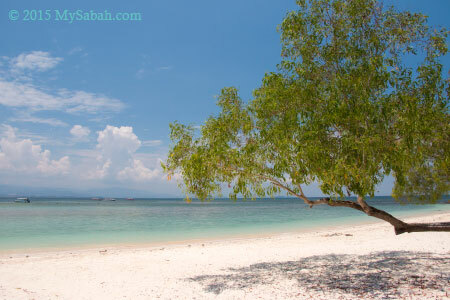 For more nice photos, you may browse 100 latest photos of Mamutik Island in my photo album.